*This article originally appeared in Afloat, for full article and more photos please see Afloat article here: https://afloat.ie/sail/sailing-classes/mermaids/item/39628-dublin-bay-mermaids-make-welcome-return-to-clontarf-yacht-boat-club. The first beat saw a very close fleet with the top half getting to the windward mark within seconds of each other. 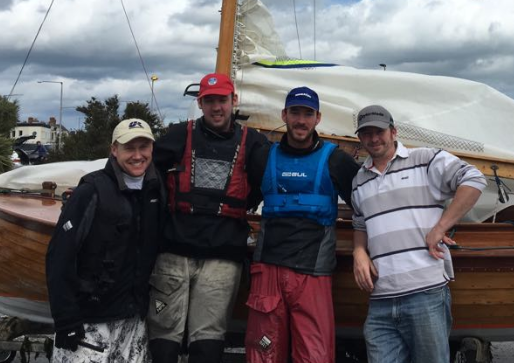 Foynes boat Three Chevrons 119 was first around the mark but with Darragh Mc Cormack 188 right on their transom. The boys on 188 proved they had the edge getting their kite under control and beating 119 to the gybe mark. It was at this first gybe mark that all hell broke loose… 119 was first to capsize shortly followed by 135 Frankie Browne, the 2 boats now trying not to crash into each other with lots of crew and sandwiches in the water. A few other broaches and capsizes kept the rescue team very busy and for a finish 4 boats had to retire from the race. Darragh Mc Cormack kept a cool head and sailed an excellent race getting him his first bullet of the Championship. Rush boat 191 Paddy Archer also had a great race finishing 5th in what was extremely challenging conditions and fair play to Frankie Browne on 135 who after capsizing still managed to secure a 10th place for himself. That evening Clontarf put on an excellent BBQ followed by great entertainment from their local Ukelele choir and a packed clubhouse socialised with top-class banter after what was a very eventful day. The next morning saw a fantastic spread of freshly baked scones, tea and coffee greeting the competitors as they arrived for the last race of the Championship. No delays this time and the fleet were underway bang on time at 1:45pm. A very close race between Darragh Mc Cormack and Mark Boylan ultimately saw Darragh take the lead by going left on the beat. Newcomer to the fleet, Darrach Dineen on 121 from the Royal Irish Yacht Club had an excellent race, holding 3rd place for a large majority of the course only to be caught by Sam Shiels and knocked back to 4th, an excellent result and the fleet now crowning 121 as ‘one to watch’. Another new, young helm Ross O’Shea who recently became the proud owner of 114, Nichapando had a great race finishing 6th under the guidance of Mermaid guru Enda Weldon. 4 races now in the bag as planned and the undisputable new Leinster Champion was crowned, Darragh Mc Cormack on 188 Innocence from Foynes Yacht Club claimed the title with 3 bullets (1 race discarded). With thanks to his crew Mark Mc Cormack and Johnny Dillon (plus Frankie Browne Jnr who crewed on the 17th in place of Johnny). “This has been a very important and special event for us. The Mermaids have such a long history and association with this club and seeing Peter Reilly’s Dublin Bay Mermaid number 4, Ferga return to the fleet last year was a significant milestone that reminded us that we need to keep building on this renewed interest. The Mermaid class is on the up with 5 new boats joining the fleet last year and already another 4 this year. With 27 boats entered in our 2017 Nationals we are incredibly proud of our growing fleet and are delighted to see a number of new young helms joining. We commend Clontarf Yacht and Boat Club on hosting an incredibly enjoyable and successful event, the welcome could not have been warmer and you have done your club extremely proud, the Mermaids are already looking forward to their next visit!”.